In February, Deborah Roberts’s collages of young black girls popped up in an unconventional place—a fashion editorial in New York magazine, where they wore the latest from Prada and Comme des Garçons. It’s but one sign that the Austin-based artist is having a big year, with a solo exhibition currently on view at the Spelman College Museum of Fine Art, following solo shows at San Francisco’s Jenkins Johnson Gallery and at New York’s Fort Gansevoort. 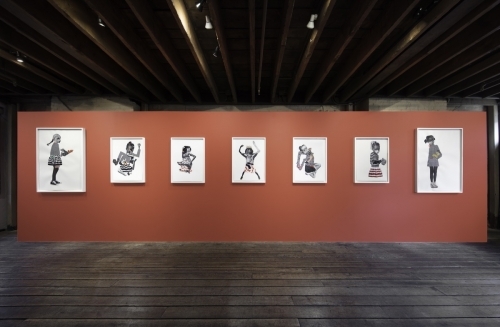 Collector interest has been fervent, and three of her collages—carefully researched assemblages of magazine photographs exploring black female identity—were recently purchased by Beyoncé. It isn’t just Queen Bey who has invested in Roberts’s career. Other recent highlights include a group show at Galerie Lelong and the Studio Museum in Harlem’s “Fictions,” the latest installment in its landmark “F” series of group shows highlighting groundbreaking artists of African descent. Mark Bradford, Rashid Johnson, Mickalene Thomas, and Nick Cave are but a few of the now-ubiquitous artists who emerged partly due to previous exhibitions in the series; in “Fictions,” Roberts was featured alongside fellow member of the Artsy Vanguard, Amy Sherald, and other on-the-rise artists like Nikita Gale and Genevieve Gaignard.